The First Deadly Sin made him a success. The Tenth Commandment made him today's best-selling suspense novelist. 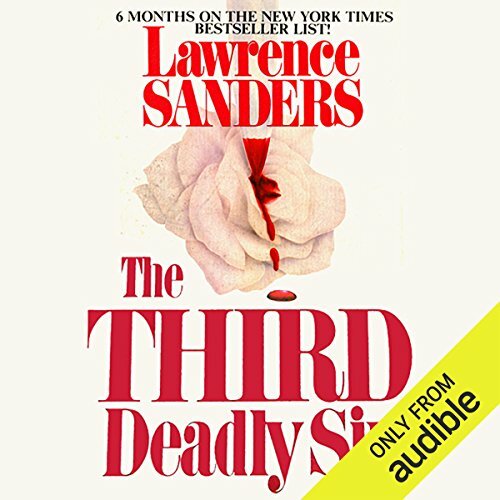 Now Lawrence Sanders presents his biggest and best ever: the nonstop thriller about a "Hotel Ripper" stalking New York's nightside with a Swiss Army knife and the retired cop named Edward X. Delaney determined to catch him. Or the killer. ©1981 Lawrence Sanders (P)2011 Audible, Inc. Psychological thrillers don't get better than this. The Deadly Sin series always cares deeply about its characters and Sanders takes considerable time making sure they appear as real, breathing human beings. But the third book in the series is a masterpiece by itself. You do not need to be a Sanders fan - or even a previous reader of this series - to enjoy it thoroughly. Written ten years before Aileen Wuornos embarked in her deadly killing spree, Sanders predicts the first female serial killer in American history and tries to imagine what she might be like. Her descent into madness is fascinating and horrifying to watch, as is the methodical Edward X. Delaney as he chases her. Though Wuornos was not nearly the type of killer that Sanders creates in the "Hotel Ripper", this is a wonderful, intellectual and satisfying read. Buy it now. You'll thank me later. I have always been a Lawrence Sanders fan. True to form, he doesn't disappoint in offering this story. Try as I might, I could not help feeling sympathy for the killer. If ever there was a need for psychiatric help, this story screams for it. I love the way Sanders manages to include his teams' efforts in discovering the serial killer by hard work and dedication. Also amusing, is the time spent in enjoying the various appetites of the Captain. (Makes you want to pause and go to the refrigerator.) Still, I could have passed on what I thought to be a little, 'preachy' about the plight of women in this country. (We already knew that.) And, as much as I admire the main character, I don't always agree that everything in life is black and white and no gray areas. Adding the female killer was an interesting twist in this series, but I think that Sanders struggled a bit with writing her. As a result I found her a little hard to relate to and found her motives weak. Would you ever listen to anything by Lawrence Sanders again? If you could play editor, what scene or scenes would you have cut from The Third Deadly Sin? Leave in one or two paragraphs about the women's lib movement, then STOP. The inner workings of women shouldn't be used as a voyeuristic prop device on every page. First, that's interesting, then uncomfortable, then, just, yuck! I tried to enjoy the mystery beneath the breasts, the cramps, the flowers symbolizing true womanhood, the men who are portrayed as either pansies or brutes...but no. Simply put great Detective series. The books get better and better along the series and this a testament to it. I love how you never know how it is going to end. This series get you tugging at yourself and wondering whether the outcomes are going to be to your personal satisfaction due to the realism of the characters and the situations. I recommend a listen of the series starting with The First Deadly Sin!!!!! If you could sum up The Third Deadly Sin in three words, what would they be? I love the narration. Marc Vietor does a great job. His voice is very pleasing. He brings some depth to the characters with inflections specific to each character. I find the enitre book interesting because it is a snapshot of the past - before everything became politically correct. It is a lengthy listen, but I enjoyed it. Out of sync. Consequences revealed before action. What did you like best about The Third Deadly Sin? What did you like least? Liked being reminded of New York in the 70s, and the attitudes toward feminism. I did not like the fact that episodes appeared to be out of order. This may have to do with the audio editing. Sanders style of psychology was as usual interesting. Also enjoy his detailed moments, such as sandwich making etc. However, as I have listened to the First and Second Deadly Sins, I have begun to find Sanders plotting repetitive. Yes. He is excellent as usual. I love his rich comforting voice. He is one of my favorite performers, and I would buy a book based solely on his reading. Did The Third Deadly Sin inspire you to do anything? Watch out for mousy thirtyish female hotel employees. My husband and I both liked this book. It is obvious it's a male author when he talks about a woman's time of the month. It's not worded the way a woman would talk about it. The story has some good characters and I didn't expect some of the twists. Worth the read or listen. Great story. the ending was a true O'Henry style. I definitely did not Ser that coming.